Operating a small business is a challenge of balancing costs, time and marketing for your new customers. Surely, one of the most important aspects of any business is communications with your customers. REAL Mobile offers a variety of options that make your business communications very inexpensive without sacrificing important features that any business requires. In actuality we offer features that are available at only the most sophisticated and expensive office systems for prices you won’t believe. If you are tired of overpaying your local phone company for a basic phone plan that under delivers, consider making the switch to the REAL Mobile Complete Business PBX phone system. The REAL Mobile PBX includes Auto Attendant, music on hold, call transfers, voice mail for each extension and a whole host of other neat features like customizing greeting messages, custom messages while your customers are on hold, and more. Customers love our affordable phone plans and the flexibility that comes with no contract service. To learn more about what type of phone is right for you, read more below! Although you can design your phone system ala carte REAL Mobile has made it REAL easy with the Complete Business Telephone System in a Box. This is a single phone and arrives programmed and ready to go. You can add your greeting (if you want), and other customization later or, call REAL Mobile customer support to assist with any tweaking. The package costs $73.99 and includes the deskset and the first month nationwide service. Then just pay $24.99 monthly for nationwide service. You will not find business phone service for less. There are no technician visits needed. The REAL Mobile system works in the “Cloud” so there is no equipment needed at your site. Simply connect to an Internet outlet and you have service. The less headaches the better for your business and with this plug and play business phone communications cannot be easier. Be up and running in minutes. Need another extension? It’s as easy as plugging in another phone. REAL Mobile can setup and ship another deskset, or, you can download a free PC softphone and make and receive calls from your computer, table or smartphone. It really is that easy. Mobile and don't use a deskset? The REAL Mobile PBX system is ideal for you. Simply download our free mobile APP to your smartphone or tablet and let the auto attendant answer your calls. Then transfer to you or your associates ... to anywhere. There is no need to purchase the deskset and you have a professional virtual receptionist greeting and transferring your calls. You will have voice mail, music on hold, and all the features listed here. Add eFAX to complete your office. 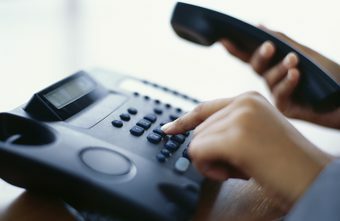 Many individuals can be confused when comparing office phone services. There are many offers that appear inexpensive and solve your immediate phone service issue. The problem might be your ability to have features you have not thought of yet. For example, say you just team-up with a new associate that works from home … across the country. The REAL Mobile PBX can easily transfer calls (directly or through the auto attendant) to your new associate. Your new associate can also be part of your network with a personal extension. Can you get these features with a less sophisticated device without having to purchase equipment for the individual site? International calling, International roaming, 800 numbers, virtual numbers for any location (local area codes numbers), mobile softphones, eFAX, audio conferencing on demand are all available on the REAL Mobile PBX system, and more … Use one feature or use them all as you need them. REAL Mobile offers a full line up of desksets to fit your needs. Start with a high quality single line deskset (accommodates two callers), or get a high end video phone. Difficult to get an Internet line connected for your phone? REAL Mobile offers a line-up of WIFI phones. No need to hard wire your deskset. Full feature conference phones are also available with WIFI connectivity making corroboration very mobile. We hope that we have made your purchasing decision much easier after learning about the many different types of business phone plans offered by REAL Mobile. If you would like to view our entire inventory of business plans and phones, visit our online store today! As one of the nation’s top providers, we offer affordable phone plans that were designed to accommodate every type of lifestyle. To learn more about our phone deals, or if you have any additional questions or concerns, don’t hesitate to reach out to REAL Mobile today! As part of our goal to provide the most value possible to our customers, REAL Mobile offers a variety of smartphones that are available in several types of conditions. We currently carry phones that are new, certified pre-owned, refurbished, and A-stock. These may seem like confusing terms for many individuals, which is why we will be outlining each type of phone condition so that you can make a purchasing decision based on knowledge and understanding. If you are tired of overpaying for a mobile phone plan that under delivers, consider making the switch to REAL Mobile. We are the top mobile service provider offering unlimited talk and text plans, nationwide LTE 4G coverage, and so much more. Customers love our affordable cell phone plans and the flexibility that comes with paying as you go. To learn more about what type of phone is right for you, read more below! New smartphones are exactly what you would imagine them to be. All new REAL Mobile smartphones come sealed in their original packaging, and also include an extended 30-day warranty from REAL Mobile. If you are wanting to purchase an untouched phone that is sure to provide you peace of mind, look no further than REAL Mobile’s new smartphones. Many individuals can be confused when comparing certified pre-owned phones with refurbished phones, however, their differences are rather simple. A certified pre-owned phone is usually well taken care of and will be required to pass a stringent quality check before being restored to default factory settings. As with all REAL Mobile prepaid phones, certified pre-owned phones also include a convenient 30-day warranty. Refurbished smartphones are often sold at a discounted price, as they are generally returned to the manufacturer in faulty state, where they are then restored to working condition with factory default settings. Refurbished phones often feature new parts, as some parts may need to be replaced to restore the phone to its default state. Included with each refurbished phone from REAL Mobile is an extensive 30-day warranty to provide our customers with peace of mind. A-stock phones vary slightly when compared to refurbished smartphones. Customers that purchase A-stock phones will receive a fully functional smartphone that may have some cosmetic defects, such as scratches or nicks. However, A-stock phones are repackaged and have been tested to ensure that you receive your A-stock smartphone in working condition. Like all of our REAL Mobile phones, A-stock phones also include a 30-day extensive warranty. We hope that we have made your purchasing decision much easier after learning about the many different types of smartphones offered by REAL Mobile. If you would like to view our entire inventory of pay as you go phones, visit our online store today! As one of the nation’s top pay as you go mobile providers, we offer affordable cell phone plans that were designed to accommodate every type of lifestyle. To learn more about our prepaid phone deals, or if you have any additional questions or concerns, don’t hesitate to reach out to REAL Mobile today! If you have ever dreaded receiving your monthly cell phone bill, you are probably aware that most smartphone plans can accrue astronomical costs over the course of a year. 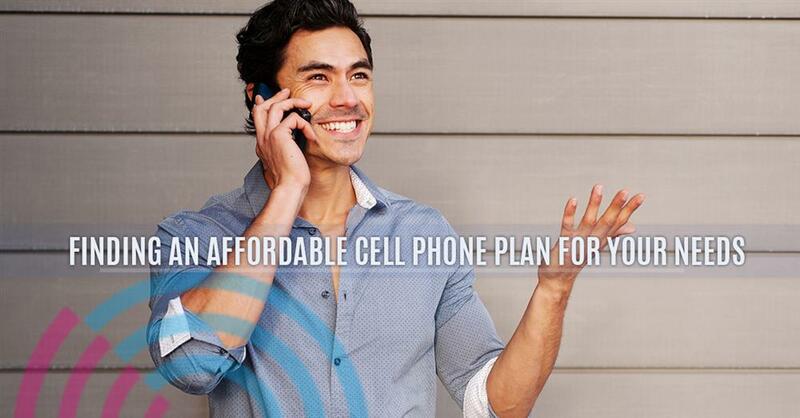 With so many data plans to choose from, you may have a difficult time finding a plan that meets your personal needs. After all, you wouldn’t want to be paying for more data than you actually use. That’s why, in today’s article, we will be taking a look at a variety of data plans offered by REAL Mobile, so that you may find a price point that fits your lifestyle. At REAL Mobile, we are the premier provider of pay as you go smartphones offering stunning service on the nation’s leading LTE 4G network. From unlimited talk and text plans, to pay as you go cell phone plans, we are confident that we offer the best no-contract phones to customers worldwide. If you are interested in learning about our prepaid cell phone deals, continue reading more on the topic below. If you find that you use your mobile phone for the most basic tasks, such as responding to emails, texting, and making phone calls, our $30 unlimited talk and text plan is perfect for you. With 250 MB of data, this plan is optimal for the economically savvy individual that finds themselves frequently on the go. With the option for an additional 500MB of monthly data, you can easily manage daily tasks on your phone without worrying about exceeding your data limit. A slight step up from our $30 plan, the $40 unlimited talk and text plan is a great choice for those that are looking for a middle-of-the-road plan. 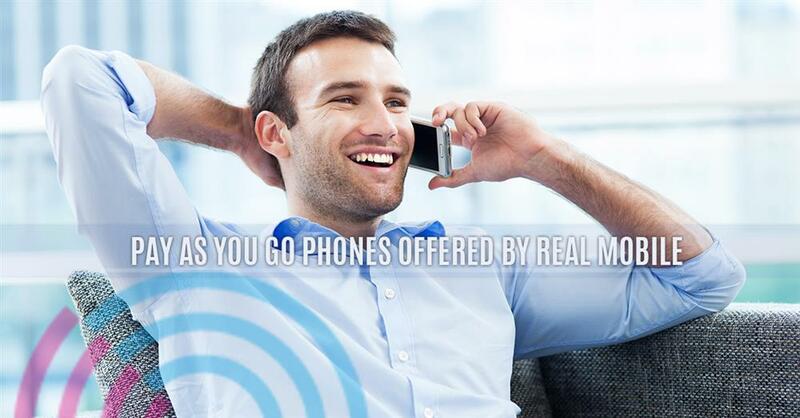 For just $40, REAL Mobile provides users with high-speed unlimited data, up to 1 GB. With international texting capabilities, you can rest assured that you can easily contact your family or friends from anywhere around the world. This is a great plan for those that are looking for a little extra juice out of their smartphone without breaking the bank. With nationwide coverage and unlimited 4G LTE internet speeds, users can’t go wrong with REAL Mobile’s $50 unlimited talk and text data plan. Customers will love the blazing fast speeds they will experience with up to 8 GB of high-speed data while also being able to make direct dial calls internationally using our special rates. If you frequently browse the internet throughout the day, or often work from your phone, REAL Mobile’s $50 unlimited talk and text plan was designed with your needs in mind. Our premium data plan for customers who demand the most from their smartphone, the $60 unlimited talk and text plan is for customers who keep their phone by their side at all times. With unlimited high-speed data up to the first 3 GB of usage, our $60 plan ensures that you will never miss a moment while browsing the internet. Customers will also love our Unlimited Data Plus feature that offers consistently lightning-fast internet speeds. This is just a brief outline of some of the many mobile phone plans that we offer our customers. To view a complete summary of every plan offered by REAL Mobile, simply visit our website and check out our “Plans” page. If you are ready to make the switch to the nation’s top pay-as-you-go cell phone plan, contact our staff of professionals at REAL Mobile today. We will be happy to help make your transition to a new phone as easy and pain-free as possible. We look forward to hearing from you! Ready to purchase your next phone but don't know which phone is right for your needs? Read about the top pay as you go phones available on our online store! Are you considering switching to a no-contract phone? Read here to learn more on why no-contract phones save you frustration, time, and money. Make the switch today with REAL Mobile! Are you experiencing speed issues with your mobile phone? REAL Mobile has compiled a list of five easy ways to optimize your phone's performance.